In the US, tattoos, once thought of as more of a fringe or alternative practice, are becoming practically mainstream and are often used as a form of self-expression. There are still some stereotypes remaining, however. Most people getting a tattoo are not doing so to appease the views of others, of course, but there is one consideration you might not have considered: your health. If you’ve ever gotten a tattoo, or thought about it, chances are high that you weighed the artistic and social aspects of it far more than the health aspects. But, unbeknownst to many, a significant number of people with tattoos have experienced lasting health issues as a result. In 4 percent of the cases, the symptoms went away within four months, but for 6 percent symptoms such as itching, scaly skin, and swelling lasted much longer. Chronic reactions occurred more often in people with more colors in their tattoo, particularly shades of red. Past research has also found “red pigments are the commonest cause of delayed tattoo reactions.”10 One study conducted actual skin biopsies from red tattoo reactions and determined interface dermatitis was the primary problem, in many cases due to an allergic response. In many cases, however, “overlapping reactive patterns were identified,” which suggests the red pigment was irritating the skin and body via multiple mechanisms.11 In addition to red, pink and purple colors were also commonly involved in reactions. “[Dr. Marie C. Leger, assistant professor of dermatology at NYU Langone Medical Center]… got motivated to study tattoo complications after treating a patient who developed itching and raised, scaly skin around only the red parts of a tattoo on her arm. She had the first tattoo for years but the symptoms started after getting a more recent tattoo on her foot. 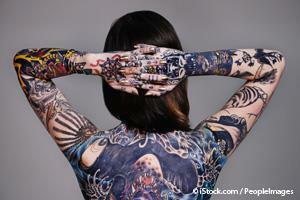 In addition to the problems at the tattoo site, she developed a rash over her whole body. While tattoo parlors are often inspected to ensure safe practices (such as the use of single-use needles), however tattoo inks typically fly under the radar. Inks and ink colorings (pigments) used for tattoos are technically subject to regulation by the US Food and Drug Administration (FDA) as cosmetics and color additives. In 2011, a study in The British Journal of Dermatology revealed that nanoparticles are indeed found in tattoo inks,16 with black pigments containing the smallest particles (white pigments had the largest particles and colored pigments were in between). Nanoparticles are ultramicroscopic in size, making them able to readily penetrate your skin and travel to underlying blood vessels and your bloodstream. Evidence suggests that some nanoparticles may induce toxic effects in your brain and cause nerve damage, and some may also be carcinogenic. Further, nanoparticles from tattoo ink were found to exist in both the collagenous network of the skin as well as around blood vessels, according to the University of Bradford researchers. While red ink appears to be associated with chronic skin reactions and those that are allergic in nature, black ink is also implicated in health problems. This might be, in part, because of its high concentration of nanoparticles. “Black tattoo inks are usually based on soot, are not regulated and may contain hazardous polycyclic aromatic hydrocarbons (PAHs). Part of PAHs possibly stay lifelong in skin, absorb UV radiation and generate singlet oxygen, which may affect skin integrity. There is much yet to be learned about how these pigments interact with your body. For instance, National Center for Toxicological Research (NCTR) studies show that Yellow 74, a common yellow tattoo ink, is broken down by enzymes and metabolized by your body. “…regrets after a tattoo are also seen and requests for tattoo removal are rising. Laser tattoo removal using Q-switched lasers are the safest; however, complications can occur. Acute complications include pain, blistering, crusting and pinpoint hemorrhage. Among the delayed complications pigmentary changes, hypopigmentation and hyperpigmentation, paradoxical darkening of cosmetic tattoos and allergic reactions can be seen. 10 Clin Exp Dermatol. 2003 Sep;28(5):508-10. 11 Skin Res Technol. 2015 May 29. 15 University of Bradford, Can Tattoos Cause Harm? 16 17 Br J Dermatol. 2011 Dec;165(6):1210-8. 18 Exp Dermatol. 2010 Aug;19(8):e275-81. 21 Exp Dermatol. 2013 Jul;22(7):464-9. 24 26 J Cutan Aesthet Surg. 2015 Jan-Mar;8(1):30-6.